Today, The Edgefield Advertiser wishes Mamie Rearden many happy returns on the occasion of her 114th birthday. 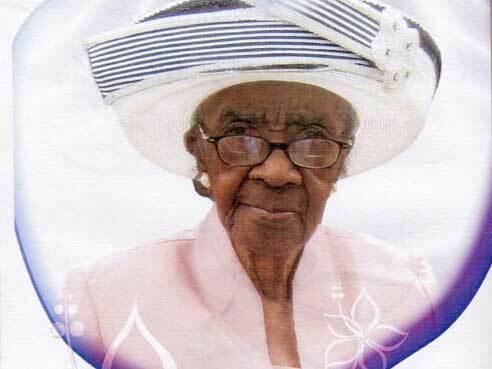 LivingSuperCentenarians.com, an organization that tracks all known persons over the age of 110-years-old, ranks Ms. Rearden as the 6th oldest person in the world and the oldest, living, black person. We are proud to have Ms. Rearden as a neighbor here in Edgefield County and we wish her well. Previous reporting of Ms. Rearden’s early birthday celebration with her family. Correction: We apologize for the previous misspelling of Ms. Rearden’s name. Ed. 6 Responses to "Happy 114th Birthday Mamie Rearden"
LivingSuperCentenarians.com is not an organization. The website name is registered by a person, Kristin Lewis, who have registered many other similar websites. This link is what the website, LivingSuperCentenarians.com, relies on for the data on living supercentenarians. Thank you for this information Mark. Above all, happy 114th Birthday Mamie, god bless you. Yes, like many websites that utilize sources, livingsupercentenarians.com references and credits the GRG for some of the information on our site. The GRG is a wonderful resource and does an incredible job. We are simply an independently owned single website, that accumulates information for our users and is growing rapidly, striving to provide a broader base of information exclusively about the single niche of living supercentenarians. We own no other “websites” about supercentenarians and have not made a dime off our website. We present our information with our visitors in mind. This is a labor of love. We compliment and provide a user friendly format with easy to find and up to date data specifically for living supercentenarians. You are welcome. On a forum (The 110 Club) where I’m an administrator, someone mentioned about spotting a spelling error on Mamie Rearden (spelled “Reardon” here in this article.) Can that be corrected? Much appreciated! Thank you for your reply. It’s most appreciated to understand where you are coming from. Some members of GRG, including myself, have applauded how your website have developed since February 2012 to present. One had noted that some of their publications (books) appeared in your Supercentenarian Books section. I apologize for the confusion of using the word “websites” as I had found this link back in March 2012 (http://www.whoismind.com/email/save10bucks@yahoo.com.html). I immediately recognized several names of living supercentenarians but did not know what to make of that list. It’s amazing that you are doing this as a labor of love. Apologies for the misspelling of Ms. Rearden’s name. It has now been corrected. Thank you for bringing the error to our attention. Thanks for the reply back Mark. Yes, I own a few supercentenarian top ten domain names and if I had the time, wanted to devote entire sites to some of these amazing people. Unfortunately, I just dont have the time, so I devote it all to livingsupercentenarians.com and alternatively set up a top ten page on the site.